Kinetic Arts Center hosts events and performances in our space! No two shows are ever the same. Our one-of-a-kind live performances are professionally produced and awe audiences year after year. Are you looking for a large event venue for your film screening, team building event, company party, or…? Contact us at 510-444-4800 to discuss your vision and to book your event. Circo Day Camps have arrived! Click HERE for registration and dates! SUMMER CAMPS are now open for enrollment! Click HEREfor registration and dates! Travel to Planet Mahna Mahna with Circus Gilly and discover a mysterious alien world of adventure and unknown. A small group of interstellar travelers find this planet full of circus fun and athletic prowess and try to meet and interact with creatures they dont always understand. 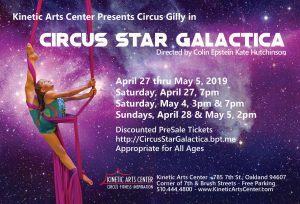 These creatures all come together to communicate and express themselves with some of the best circus skills and performances in the universe! Discounts Pre-sale Tickets are Available Now! Show runs approx 1hr30min, with 15 min intermission. All Audiences Welcome! Wheelchair accessible. Service dogs only please. Limited free off-street parking available in the Kinetic Arts Center parking lot. Additional free street parking also available. All Audiences Welcome! Children under 2yrs are free. Wheelchair accessible. Service dogs only please. Limited free off-street parking available in the Kinetic Arts Center parking lot. Additional free street parking also available.